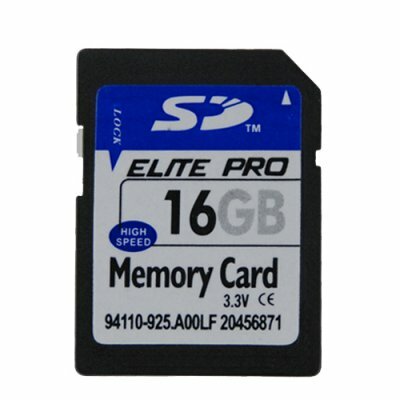 Successfully Added 16GB SD Memory Card (Single) to your Shopping Cart. SD card (16 GB) for use with today's portable electronics. This new wholesale priced SD memory card allows you to expand the memory in your portable electronics so you can have the enjoyment of taking more photos, videos, and music with you without worrying about running out of storage space! We know it can be frustrating to have a great new digital camera but such a pain not have enough space to save all the days action. Well, that problem has now come to an end - a single SD card with a huge 16 GB's of memory! If your portable electronic device is compatible with the SDHC cards (SD high capacity), then you are in for a treat. 16GB's is enough memory for storing literally thousands of photos, hours and hours of video, or thousands of MP3's. This card can also be used like a USB flash drive for transferring files from one computer to another or even as a long term data storage device. Don't be fooled by the low price, these are 100% factory direct brand new SD cards. The original holographic seals and individual plastic cases help ensure you get the best quality possible, while still being at a low direct to you wholesale price. Çok kısa sürede geldi. Süper ürün. Çok hızlı. 16 GB Ful video çekimi yaptım hiç takılmadı. Teşekkürler. Same thing runs for about $74 at the local big shop.